Someone must have remembered Sam Katzman in their will because somehow he scraped up enough money to go on location to Big Bear Lake to shoot Queen Of The Yukon. It is certainly an above average Monogram Pictures product and could have been a classic at a major studio. Possibly he felt a property that had its origins in a Jack London story was worth the expense. 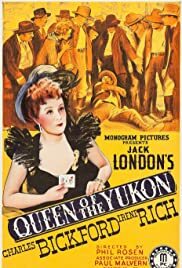 The title role in Queen Of The Yukon is played by Irene Rich who owns a gambling boat in a backwater of the Yukon Territory. Her partner and best friend is Charles Bickford, toughest man in the territory. She'll need him because Melvin Lang who is the head of a big mining outfit is fixing to do a lot of claim jumping. He's got another boat which is the only way in and out of the region other than a rugged overland trip and he's hired some toughs headed by Tris Coffin to run the prospectors off. Rich also has some domestic problems. Her daughter June Carlson has left finishing school and has come up to see her mother and she has no idea Mom is the Queen Of The Yukon. On the same boat is young Dave O'Brien who has hired on as a surveyor for Lang not knowing what a crook he is. It's all straightened out in the end as O'Brien proves he has the right stuff for the Yukon. For Monogram this film passes as an A product and it's not bad at all. Even Jack London purists will like this one.